The X1 Turbo Z is the successor of the X1 Turbo III. The name of the X1 serie becomes a bit surrealistic ! The Turbo Z enhances the graphic and sound characteristics : more colors and more voices. It can display the 4096 colors simultaneously in the 320 x 200 mode. It was also possible to digitize video samples! - Z II is VCCI compliant (electromagnetic emissions control) and has 128 KB RAM as standard. - Z III does not have any remote connector for data recorder. Otherwise it is identical to the Z II. The languages available were Hu-basic (developed by HUDSON soft), Turbo Basic and new Z-basic. 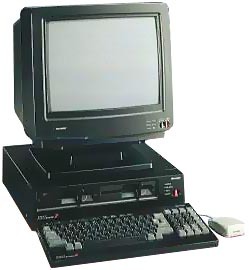 The new Z basic language introduced enhanced functions (graphics and sound), but needed 128 KB RAM to operate. It was bundled with the Turbo ZII and ZIII, but Turbo Z owners had to buy it separately. An expansion memory board fitted with 64 KB RAM was then sold with the box, so Turbo Z systems could have 128 KB RAM. In fact you could add up to 256 KB RAM on this board, so Turbo Z owners could finally upgrade more easily their systems than ZII and ZIII ones. see more Sharp X1 Turbo Z (CZ-880C) Ebay auctions !